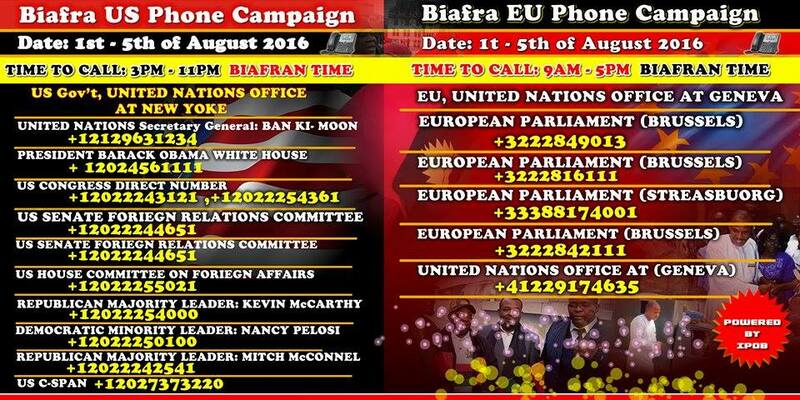 This August; Biafrans and friends all over the world will commence another round of phone campaign to officials of United States of America (USA); European Union (EU) and United Nation (UN). This is the 11th month Nnamdi Kanu the leader of the Indigenous people of Biafra has illegally been detained for exercising his rights within the confines of the law. This right in question is the right to self-determination which is widely viewed as a sacred right. This is also a man who refused to build an army but built a radio station through which freedom of speech defined the civil approach he has used in discharging the activities for the restoration of Sovereign state of Biafra. This right which was declared in 2007 by UN gave free indigenous people right to aspire or agitate for self-determination. It is understandable that without this declaration, Nnamdi Kanu would not have stood firm to ask for self-determination. By virtue of this declaration, he has committed no crime ever known to man for asking for the restoration of Biafra but yet he languishes in prison for cherishing the UN declaration. We the people of Biafra feel betrayed by the custodians of international declarations or treaties. Freedom of speech was abused and imprisoned in Nigeria and by virtue of the continued silence of UN and EU; the UN 2007 declaration appears more like a fraud to the people of Biafra. Nnamdi Kanu is a victim of international law, and international communities are expected to intervene. Nnamdi Kanu suffering for his loyalty to the call made by UN is the worst discrimination of our time. He has been tortured and denied the right to his freedom, denied the right to fair hearing and denied the right to opinion or view. This is happening because, in 2007, a declaration by UN told him he has the freedom to agitate and will be protected by the guarantee contained in such declaration. But today the child of their act or charter is left to die, but Biafrans won’t let that be as we call upon the mother of the charter. Despite this condemnable act by Nigeria which has led to the death of thousands of innocent Biafran youths protesting for the unconditional release of Nnamdi Kanu, Biafrans have remained peaceful and law abiding. Since the arrest and continued detention of their leader; Biafrans have come under attack and despite this attack, they have remained resolute and never retreating or surrendering, a move that has increased the military action ordered against them by Buhari. Biafrans have no weapon to fight as 1967 genocide still lives in their memory, and they are being killed for being Biafrans. Genocide is currently going on in Biafra with Islamic extremism taking a new shape since the inception of the Islamic government of Nigeria. Fulani herdsmen laying siege and Saudi black water mercenary deployed alongside Nigerian soldiers in Biafra land. While our leader is incarcerated, they are sufficiently slaughtering us. We shall continue to call and disturb the world and relevant authorities till we are heard and rescued from extermination. We say no to war or violence thus we today call the world to our rescue. 1. This is the 10th month Mazi Nnamdi Kanu has illegally been in detention, a leader that built a radio station instead of an army, fought for self-determination with words of truth instead of guns and bombs. Ask them to help in working to free the leader of Indigenous People of Biafra (IPOB), Nnamdi Kanu – the prisoner of conscience. Tell them how he was illegally abducted for exercising his right under United Nations rights of Indigenous peoples and self-determination.